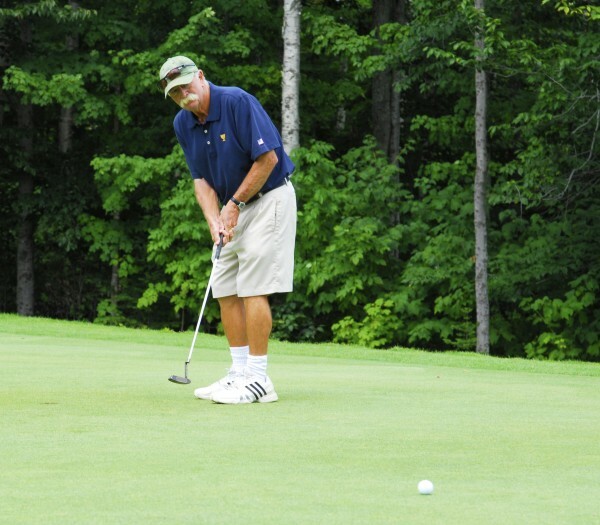 Mike "Fluff" Cowan sinks a 50-foot putt to win $5,000 during Carrabassett Valley Academy's 28th annual Golf Classic Tournament over the weekend at Sugarloaf Golf Club. CARRABASSETT VALLEY, Maine — PGA caddy Mike “Fluff” Cowan, a Waterville native, sank a 50-foot putt for $5,000 during the Carrabassett Valley Academy’s 28th Annual Golf Classic Tournament to benefit the Martha B. Webber Scholarship Fund over the weekend at Sugarloaf Golf Club. During the final hour of the putting competition Cowan was the last golfer standing with an opportunity to make a 50-foot putt for $5,000. Not even Cowan’s signature mustache could hide his smile as the ball fell into the cup. He generously gave his winnings back to CVA. Cowan has caddied for Ed Sabo (1976-78), Peter Jacobsen (1978-96), Tiger Woods (1996-99) and Jim Furyk (1999-present). Through his career, Cowan has become one of the PGA’s most recognizable caddies. Also in attendance were New England Patriots Hall of Famer Gino Cappelletti and two-time Olympic gold medalist Seth Wescott of Farmington. Over the years, the CVA tournament has raised more than $1.1 million for Maine students in need of financial assistance, according to a press release from the school.